Sorry, it's been a busy few autumn days. 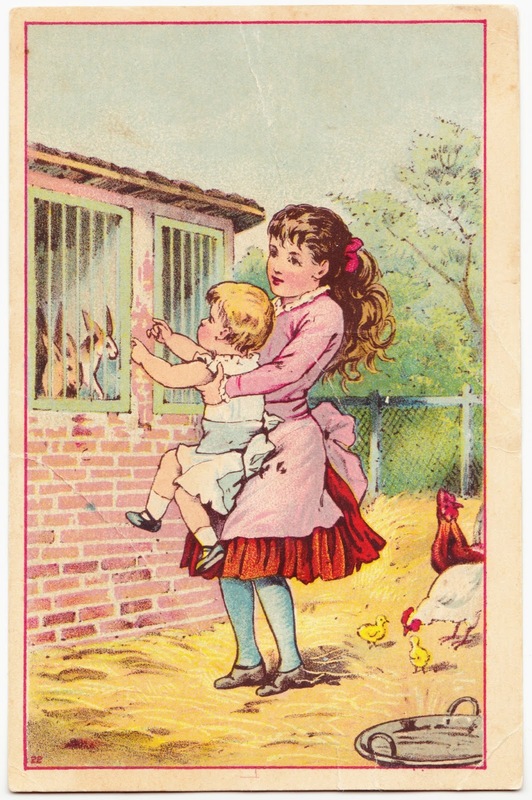 To get us back in the flow, here's a Victorian advertising trade card featuring a young girl, a toddler, caged bunny rabbits and some yard chickens with their chicks. This card measures 2⅞ inches by 4-7/16 inches. (I was feeling like being uber-precise.) A good chunk of the back side is gone, because it was glued into a long-ago someone's long-ago album. But can tell you that it's advertising New Process Starch from Firmenich Mfg. Co. of Peoria, Illinois, and Marshalltown, Iowa. "A successful and representative house in Chicago engaged in the manufacture of table syrup, starch and glucose is that of the reliable Firmenich Manufacturing Co., whose offices are located at No. 278 Michigan street. The works of the company, which are admirably equipped with all the latest improved apparatus and appliances, are at Peoria, Illinois, and Marshalltown, Iowa. This company was duly incorporated in 1884 under the laws of Illinois with ample capital, since which period it has built up a liberal and influential patronage in the middle, west and north-western states." The short section on Firmenich continues with such ebullient praise that I think it was simply written by the company itself and submitted to the book's editors. 1. Here's a picture taken yesterday from one of the York Fair Ferris wheels. It's too high up to see the chickens in any detail.